Network Radio was at a frustrating crossroad in 1952. The advent of affordable television receivers during the years of prosperity following World War II found the major networks scrambling to cover as many bets as possible as the 'new' medium of television was discovered by the masses. Television had been available for the elite throughout America for almost 15 years, but it was only the most prosperous Americans that could afford a receiver. Well mounted dramatic presentations had always been one of the prestigious mainstays in network programming--for the networks that could afford presenting them. Even more prestigious were the Radio dramas adapted from Stage plays. The New York Stage had always been the epicenter of the world of the Stage in the U.S. and the drama critics who covered the Broadway Stage were at the very center of that prestigious world. Drama crtics held the power to make or break all but the most well-mounted productions. And indeed even some of the more popularly received stage productions of the era could feel the sting of a well-respected critic's pen. 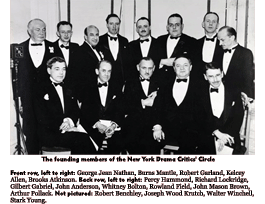 The New York Drama Critics' Circle was a particularly powerful body throughout the 20th Century. Composed of the 'anointed few,' the 'Circle' held sway that extended far beyond just the Broadway Stage. Instant members of New York Society's vaunted '400,' simply by virtue of their profession, their ability to freely rub elbows with most of the potential backers and 'angels' for the New York Stage simply added to the critics' power. In an effort to reestablish the prestige that network Radio had enjoyed for the previous twenty-five years, both CBS and NBC went toe to toe during the years they were losing audience share to Television with all manner of high-profile dramatic productions. But mounting such productions was an even riskier proposition during the early to mid-1950s; especially Stage play adaptations for which the producing network would have to meet a much higher bar of expectations--by critics and listeners alike. What better way to guarantee critical acceptance, than to enlist members of the New York Drama Critics' Circle in selecting the plays for such a production. Best Plays was another of the prestigious sustaining productions of the NBC Presents family of presentations from the National Broadcasting Company which, over the years, had presented numerous consistently rich, high-production value series' of NBC-produced and financed dramatic productions. Announced almost six weeks previously, NBC decided to wait until the summer of 1952 to introduce the series as a summer replacement for their Theatre Guild series. And indeed, the series was so well received as a summer series that NBC extended the franchise for another full year season. Where this production differed was in presenting 20th Century, award winning Stage Plays exclusively. The common demoninator for the selections were, for the most part, their previous identification by the New York Drama Critics' Circle as a 'Best Play' of the season. With the exception of Alexandre Dumas and William Shakespeare, the series showcased most of the finest contemporary authors of the modern era--many of them Pulitzer prize winning plays. The list of truly remarkable, contemporary actors was also one of the signature features of this series, employing over 100 of The Golden Age's most well-known, accomplished dramatic actors from Stage, Screen, and Radio. John Chapman, the noted Drama critic for the New York Daily News, hosted the series. Indeed, Chapman's fascinating and insightful introductions to each play remains one of the series' most interesting aspects. The former Dean of Manhattan Drama Critics, Burns Mantle, had previously hosted and commentated on NBC's Great Plays (1938-1942), one of the first NBC 'educational features' that eventually comprised its run of various NBC Presents programs. Robert Burns Mantle passed away in 1948, but it was Burns Mantle's annual compendium of 'Best Plays' that served as the inspiration for the Best Plays in 1952. This was a highly polished, natural progression of the NBC Presents franchise and clearly maintained NBC's franchise as the gold standard in Radio Drama. Though running for only 52 productions in all, this series remains one of the most overlooked--but highly collectable--productions in Radio. Well worth a listen to the entire run. Burgess Meredith, Maureen Stapleton, Joe DeSantis, Edwin Jerome, Roger De Koven, Joseph Julian, Ralph Bell, Bill Lipton, Gilbert Mack, Matt Crowley, Parker Fennelly, Mildred Natwick, David Anderson, Peter Capell, William Griffis, Agnes Young, Teri Keane, Luis Van Rooten Karl Weber, Vincent Price, Judith Evelyn, Melville Cooper, Elizabeth Eustis, Margery Maude, John Sylvester, Anne Burr, William Zuckert, Guy Spaull, Victor Chapin, Ivor Francis, Maurice Ellis, Don Stanley, Boris Karloff, Donald Cook, Jean Adair, Edgar Stehlil, Evelyn Varden, Wendell Holmes, Joan Tompkins, Arthur Matlin, Ted Osborne, Ed Latimer, Elliott Nugent, Martha Scott, Jean Adair, Alexander Scourby, John Stanley, Chester Stratton, Susan Douglas, Leona Powers, Norma Rose, William Podmore, Joseph Schildkraut, Agnes Moorehead, Joan Alexander, Betty Furness, Myron McCormick, Vera Allen, Joseph Curtin, Karl Weber, William Quinn, Denise Alexander, Gene Leonard, Donald Buka, Peter Capell, Russell Hardie, George Lefferts, Bill Lipton, William Redfield, Ray Balderek, James Stevens, Jack Lloyd. Recurring Character(s): Varied from production to production. Protagonist(s): Varied from production to production. RadioGOLDINdex, Hickerson Guide, 'The Directory of The Armed Forces Radio Service Series'. All above cited provenances are in error in one form or another. The most helpful provenances were the logs of the RadioGOLDINdex and audio-classics.com. Episode #39 is titled, Autumn Crocus, not the Autumn Croakus title originally distributed by the OTRR (until they corrected their log from our research--without crediting us). 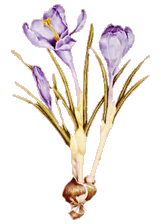 The crocus is a perennial flowering bulb of the iris family (see illustration at left.) 'Croakus' would be an entreaty from a deranged, suicidal group, much like the members of the Jamestown Massacre of the 1970s. There was a popular episode of The Munsters titled "Autumn Croakus." Perhaps that's where they found the inspiration for the original OTTER log title. Episode #28 is titled, Men in White, not The Man in White. While there is an apocryphal representation circulating that there were 54 broadcasts during the Best Plays canon, we can find no provenance to support this anecdotal assertion. As best as we can demonstrate from contemporaneous radio listings, there were two and only two rebroadcasts during the run--The Mad Woman of Chaillot and Kiss The Boys Goodbye. The widely cited repeat of Arsenic and Old Lace that supposedly aired at 53-06-14 is complete rubbish. For one thing, there was a network-wide preemption on that date for a 3 yrs of The Korean War Special. For another, the otrsite.com's elaborate Arsenic and Old Lace 'parts 1 and 2 only' citation for 53-06-14 is a complete fabrication. 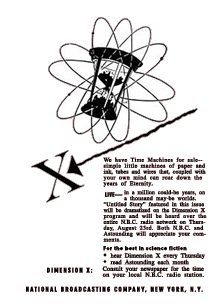 Both the OTRR and the otrsite.com site logs for Best Plays fail to cite any episode at July 26, 1953. In fact, the first airing of Kiss The Boys Goodbye, aired on that date as supported by multiple newspaper listings. The Kiss the Boys Goodbye episode widely cited for 53-09-06 was a repeat broadcast of 53-07-26, as provenanced from the spot ad in the sidebar (left) that no one in the 'otr' community has ever previously logged. As noted in our fully provenanced log below, the newspaper listings widely cited the repeat of The Madwoman of Chaillot as the final episode of Best Plays. There was never a super-secret, previously undiscovered 54th installment of Best Plays. That's entirely yet another persistent 'otr' myth. You're welcome to compare our fully provenanced research with the '1,500 expert researchers' at the OTRR and their own Best Plays log. We've therefore provided a screen shot of their current log for comparison, HERE, to protect our own ongoing due diligence. Web-wide--network-wide--preemptions are an invaluable provenance for dating and verifying the run sequence of any vintage Radio series. Without understanding the nature or breadth of a preemption, it's impossible to accurately date or sequence any run of a vintage Radio program. The present instance is a perfect example. Had any of the widely cited 'otr' loggers paid any attention to the actual preemptions, their logs would have been somewhat more correct. We ask one thing and one thing only--if you employ what we publish, attribute it. 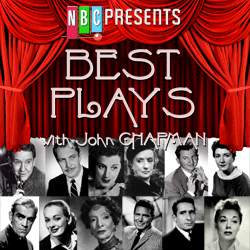 "Best Plays," scheduled to start several weeks ago, will reach NBC listeners beginning June 8. 7:30 P.M. WOAI - Burgess Meredith and Maureen Stapleton will be starred in Maxwell Anderson's drama, "Winterset," as BEST PLAYS, a new summer series, begins. "On Borrowed Time" will be the drama on Best Plays at 8:30 p.m., WSYR radio. Starring in Paul Osborn's touching play about life and death will be Parker Fennelly and Mildred Natwick. Best Plays at 8:30 on WSYR radio will present "Angel Street," starring Vincent Price, Judith Evelyn and Melville Cooper. The story deals with a man who is trying to drive his wife to insanity. A "best play" of 1944, "The Hasty Heart," will be heard on the Best Plays program at 8:30 tonight on WSYR. Anne Burr, who starred in the original Broadway production, will recreatedher role of nurse in charge of a hospital ward on the Burma front during World War II. "Arsenic and Old Lace," the hilarious Broadway hit of years back will be heard on the Best Plays program on WSYR at 8:30 tonight. Boris Karloff and Donald Cook will be starred. 52-07-13 Wisconsin State Journal - 7:30 p.m.--Best Plays (WIBA): Alfred Drake in "Dark of the Moon," story of witch boy and Barbara Allen. 52-07-20 San Antonio Express - Best Plays, 7:30 p.m., WOAI--Elliott Nugent, Martha Scott and Audrey Christie star in "Voice of the Turtle. At 8:30 p.m. on WSYR radio, Best Plays will present a dramatizationof Arthur Miller's "All My Sons." 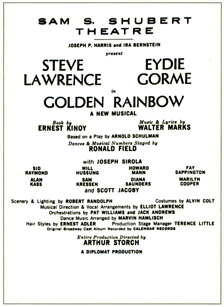 The play won the New York Drama Critics Circle award for the best American plaly of 1947. Starring in his original role in the production will be Ed Begley in the part of Joe Keller, Evelyn Varden will be heard as the mother and John Larkin as the son. You'll remember the play as dealing with a manufacturer of defective aircraft equipment which cost the lives of 27 pilots in the war. "Outward Bound," the Sutton Vane drama about death, will be the "Best Plays" offering on KFI at 5:30. Screen veteran Joseph Schildkraut will be starred in "Uncle Henry," the role he created for the original Broadway production, on 'Best Plays' over WHIZ-NBC tonight from 8:30 to 9:30. RADIO'S "Best Plays" will present the Philip Barry famous "Philadelphia Story" tonight. BEST PLAYS Presents Prize-Winning HOME OF THE BRAVE at 8:30. John Loder will play the lead role in "Blithe Spirit," Noel Coward's comedy about spiritualism. In the Best Plays series it will be heard on WSYR at 8:30. Best Plays, 7:30 p.m., WOAI: Two one-act plays by Eugene O'Neill, "Bound East for Cardiff" and "The Long Voyage Home" will be presented. Effective Oct. 3, "Best Plays" will move to 8 p.m. Fridays. Best Plays--8 p.m., WOAI--The initial broadcast will present Laurence Houseman's "Victoria Regina," starring Helen Hayes and Carl Esmond. John Chapman, drama critic of the New York Daily News, is host and narrator. THE BEST Plays program will be heard at 9 P.M. tonight, a new time on WSYR. Starred in tonight's production of "She Loves Me Not" will be Eddie Bracken and Ann Thomas. Burgess Meredith and Maureen Stapleton will star in the Best Plays dramatization of Maxwell Anderson's "High Tor" at 9 p.m. on WSYR radio. The play is about an idealist who refuses to sell his mountain top, High Tor, and how a phantom love influences his decision. Faye Emerson will star in the hour-long Best Plays presentation of S.N. Behrman's comedy "Biography." It's at 9 p.m. on WSYR radio. Best Plays on WSYR radio will give way at 9 p.m. to an address by Dwight D. Eisenhower. At 9:30 p.m. on the same staton Gov. Stevenson will be heard. Eva LeGallienne will be starred in Maxwell Anderson's historical drama, "Elizabeth the Queen," on Best Plays at 9 p.m., WSYR radio. Richard Waring will be herd in the role of the Earl of Essex. Best Plays at 9 p.m. on WSYR radio will star Aline MacMahon in "The Madwoman of Chaillot," Jean Girandoux's whimsical fantasy. Many members of the original Broadway company will be heard in other roles of the play about a "madwoman" who rids the world of its parasites and everyone is happy. BEST PLAYS: John Forsythe in "Missouri Legend," comedy about last days of Jesse James; WBZ, 9. Best Plays, at 9 p.m. on WSLYR radio, will stage Patrick Hamilton's suspense drama, "Rope." Hurd Hatfield and Victory Jory will star in the hour-long production. The play depicts two Oxford students who strangle a man for the sheer thrill of a crime and how they are ultimately brought to justice. 9 p.m.--Best Plays (WMAQ): Donald Cook in "Skylark." JUDITH EVELYN and John Beal will co-star in "Craig's Wife" over the Best Plays program on WSYR at 9 tonight. It is the story of a wife who puts household perfection above everything else. The play, by George Kelly, won the Pulitzer Prize in 1925. Best Plays, at 9 p.m., WSYR radio, will star Mary Briand as a crotchety invalid in "Night Must Fall." Carmen Mathews will be featured in the story of a selfish old woman who bullies her associates but falls prey in the flatteries of a stranger who has an eye on her money. THE BEST PLAYS program will present "A Bell for Adano," a war play with the setting in Italy, on WSYR at 9 tonight. Arthur Kennedy and Myron McCormick will have starring roles. Best Plays (WOAI, 8 p.m.) Paul Lukas and Sally Forrest star in "Accent on Youth." BEST PLAYS Presents Sidney Kingsley's "Men In White" at 9:00. A special one-hour documentary of the 20 Roosevelt-Truman years from 1933 to 1953 will replace the regularly scheduled Best Plays broadcast. Actually the program, called End of an Era, will be a panorama of those two decades. The happy moments and the sad, the victories and the defeats, all taken from recordings, will be reviewed to the narration of Burgess Meredith. The title for the show was taken frm a remark by President Truman the morning after Ike was elected president--"this is the end of an era." BEST PLAYS presents Fredric March, Florence Eldridge in "There Shall Be No Night" at 9:00. Best Plays at 9 p.m. on WSYR radio will star Eva LaGallienne and Richard Waring in "Camille." The team will be recreating the same parts they plalyed in Miss LaGallienne's 1935 revival of the Alexander Dumas' plaly. It's the familiar story of a beautiful woman who renounced her lover then died of tuberculosis. Film stars Van Johnson and Nina Foch will star in the Best Plays broadcast of "John Loves Mary" at 9 p.m. WSYR radio. Miss Foch will be heard in the part she created in the Broadway production of the hit play. The comedy involves the dlemma of a soldier who returns from World War 2 eager to marry his fiancee but who must first dispose of his present wife, the English girl he has married as a ruse to get her into this country for his buddy. Best Plays at 9 p.m. on WSYR radio will star Geraldine Page in "The Glass Menagerie." Miss Page will portray the shy, crippled girl who lives in a dream world. Macdonald Carey and Evelyn Varden will be heard in supporting roles in the Tennessee Williams play. Returning to the airlanes after an absence of two months is the newest of the hour-long drama shows, "Best Plays." The series, replace in late weeks by the documentary Challenge of the Prisons, returns to the radio scene on approximately its first birthday. It was on April 27 last year that Best Plays, based on the Burns Mantle Best Plays books debuted. Despits its brief life, the series captured an award -- the distinguished achievement award as the best dramatic show from TV-Radio Life magazine. And aside from such honors, Best Plays has offered some pretty fine dramatic entertainment each Friday at 8:30 p.m. on WSYR radio. For its return performance, Best Plays will stage the first radio version of "Mr. Roberts," the play by Thomas Heggen and Joshua Logan from Heggen's best-selling novel of the same name. On Broadway, with Henry Fonda in the title role, "Mr. Roberts" had one of the longest runs in the history of the theater. Starring in the radio version will be Arthur Kennedy, currently starring in Broadway in "The Crucible." With him will be Wendell Holmes and Leon Janney. Two members of the original cast, Rusty Land and Steve Hill, will be featured. The play will be introduced as usual by dramatic critic and columnist John Chapman. THE drawing room comedy "Susan and God" will be presented on the Best Plays program on WSYR at 8:30 tonight. Judith Evelyn and Paul McGrath will be starred. Burgess Meredith will re-create for radio the role that he played in the movie version of "Of Mice and Men" on the Best Plays broadcast at 8:30 p.m., WSYR radio. Anthony Quinn will take the other lead role. Written by John Steinbeck, the play starred Wallace Ford and Broderick Crawford in the opening on Broadway in 1937. When the play was made into a movie in 1940, Meredith and Lon Chaney, Jr., starred. Now Meredith will again play the shrewd George while Quinn takes the role of the mentally-deficient strong man, Lennie. Dennis King will be heaard as Napoleon in "St. Helena," an historical drama on Best Plays at 8:30 p.m., WSYR radio. The play, which received apathetic response in England until Winston Churchilll endorsed it, is about Napoleon's last days. In the cast will be Horace Braham, Guy Spaul, Ralph Bell, John Stanley, and many others. John Chapman is host and commentator. Geraldine Page will be heard in her off-Broadway revival role in "Summer and Smoke" on Best Plays at 8:30 p.m. Miss Page played for a year in the Circle-in-the-Square hit revival of the Tennessee Williams play. She portrays the part originally created by Margaret Phillips on Broadway in 1948. Richard Kiley, currently appearing in "Misalliance" on Broadway, will play the role created by Tod Andrews on Broadway. It's about a neurotic girl and her love for a young doctor. On WSYR radio. THE STORY of a surgeon who disguises himself as a thief in order to test reactions at various stages of crime will be told on the Best Plays program on WSYR at 8:30 tonight. Sir Cedric Hardwicke will play the title role in "The Amazing Dr. Clitterhouse," a drama that was seen on Broadway in 1937. Best Plays--7:30 p.m., WOAI--Walter Slezak and Carmen Mathews, both currently appearing on Broadway in "My Three Angels," will be co-starred in "Autumn Crocus." The third year of the Korean war will be commemorated in a highly-dramatic, full-hour documentary at 8.30 p. m. on WSYR radio. The show was originally scheduled for a week from today but moved up. 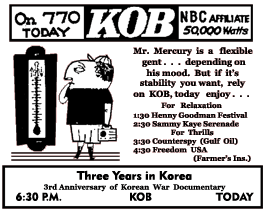 53-06-14 Wisconsin State Journal - 7:30 p.m.--Three Years of Korea (WIBA): one-hour documentary; voices of former President Truman, Gen. Douglas MacArthur, the late Al Jolson, Pres. Syngman Rhee, fighting men, Korean children. Best Plays--7:30 p.m., WOAI--Faye Emerson will be starred in "Another Language," the story of a woman's conflict with her in-laws. Best Plays (Sun. 8:30 p.m., NBC). Faye Emerson in Another Language. 7:30 p.m.--Best Plays (WIBA): John Forsythe, Joan Loring in "The Farmer Takes a Wife." Best Plays (Sun. 8:30 p.m., NBC). The Farmer Takes a Wife, with John Forsythe, Joan Lorring. 8:30 -- Special Boston Pops 25th Anniversary on-hour concert. 7:30 p.m.--Best Plays (WIBA): "Macbeth," with Eva Le Gallienne, Staats Cotsworth, Paul McGrath, Raymond Edward Johnson. 53-07-19 Charleston Daily Mail - 8:30 Best Plays Presesnts "The Rose Tattoo." Maureen Stapleton and Eli Wallach will be heard in their original roles in the "Best Plays" adaptationof the Tennessee Williams play, "The Rose Tattoo," on KFI at 5:30 p.m.
Best Plays--7:30 p.m., WOAI--"The Rose Tattoo" will be presented. Kiss the Boys Goodbye 53-07-25 Chester Times - Radio Sunday: NBC 8:30 Best Plays, "Kiss the Boys Goodbye." Helen Claire, who created the role of Cindy Lou in the Broadway production of "Kiss the Boys Goodbye" will have the same role in the radio adaptation of the play during "Best Plays" on KFI at 5:30 p.m. The play was written by another Claire...Claire Booth Luce. Best Plays (WOAI, 7:30 p.m.). Margaret Phillips and Paul McGrath will be starred in the radio adaptation of "There's Always Juliet." John Chapman is narrator of the series. Best Plays (Sun. 8:30 p.m., NBC). Margaret Phillips and Paul McGrath in There's Always Juliet. Elliott Nugent will re-create his original Broadway role when "Best Plays" presents a radio versionof "The Male Animal" on KFI at 5:30 p.m. The play tells of a professor on "homecoming day" who nearly loses his wife to a returning football hero who once was her beau. 7:30 p.m.--Best Plays (WIBA): Wendell Corey in "Detective Story," with Alexander Scourby, Elspeth Eric, Leon Janney. "Ladies In Retirement," the 1940 Broadway smash hit, will be adapted for radio on Best Plays at 8:30 p.m. today on WSYR. The story is of an English housekeeper's slaying of her employer, a retired actress. Best Plays (WOAI, 7:30 p.m.). Madeleine Carroll and Jerome Cowan will star in "Tonight at 8:30," a group of short plays by Noel Coward, originally produced on Broadway in 1936. "Ways and Means" is a comedy of a couple who find themselves strapped after having overstayed their welcome at a house party. "Still Life" is the story of man and girl who are married, but not to each other. 7:30 p.m.--Best Plays (WIBA): Helen Claire in "Kiss the Boys Goodbye." 5:30 KFI--Best Plays: "Kiss the Boys Goodbye," Helen Claire. "Ethan Frome" is play for "Best Plays" tonight, (WHIZ-NBC 8:30 p.m. Sun). It stars Geraldine Page. BEST PLAYS "The Petrified Forest" Starring Cyril Ritchard at 8:30. A repeat presentation of "The Mad Woman of Chaillot" will conclude the present Best Plays series at 8:30 p.m. on WSYR radio. Aline MacMahon will be starred. Ernest Kinoy was one of the most prolific and respected writers of Stage, Screen, Television and Radio. Though most often associated with his Science Fiction radioplays, his Radio work spans the entire gamut of genres from The Golden Age of Radio. His Radio writing was perhaps overshadowed by his later fame as a screenwriter for Television, but it's his prodigious output throughout the Golden Age of Radio that has consistently reached the greatest number of ardent admirers. The son of public school teachers, Kinoy's sense of both moral and social obligation were basic tenets of his upbringing, and are reflected over and over again throughout his body of work. Kinoy enlisted in the Army during World War II, and upon his return to civilian life became a staff writer for NBC. His career with NBC spanned over twelve years of The Golden Age of Radio, and the earliest years of The Golden Age of Television. During his NBC years his talents were tapped for both radioplays and television screenplays. During his tenure with NBC, his prolific output and extremely fast script-writing served both parties well. Remembered most for his Science Fiction series, Dimension X, he was equally busy with straight radio drama, westerns, detective drama, and stage play adaptations. During his college years at Columbia University he met and married Barbara Powers, who eventually became a leading light in her own right as a Doctor of Psychotherapy specializing in Eating Disorders. Married in 1948, their marriage endured 59 years until Dr. Powers-Kinoy's passing in 2007 of protracted pneumonia. Both of the Kinoys were social activists and jointly and separately contributed much of their respective careers to addressing social injustice and mental health issues. 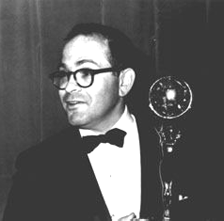 Ernest Kinoy's biography was by no means limited to his Radio work which, by itself, comprised well over 340 adaptations and original radioplays. His work in Television spanned the second half of his life and garnered him two Emmy Awards and three other Emmy nominations. Three of his books were also adapted to The Stage. Despite a highly active professional life, he also found time to serve the Writers Guild of America--East, as their President for three years. He was also the recipient of three of the Guild's most prestigious writing awards. Mr. Kinoy, now 83, and still one of Radio's treasures, remains actively semi-retired in Vermont.